on the information you provide. Are you looking for a reliable business to help you carry out your kitchen remodeling? Is affordable kitchen design one of your primary concerns as you renovate your home? If so, consider contacting the best custom kitchen company: Chicago Custom Kitchens! 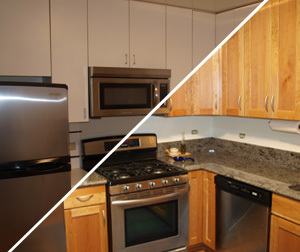 We specialize in many aspects of kitchen remodeling and strive to make sure you receive only the best service. We’ll work closely with you to ensure the final product matches your vision completely, and we’ll do so with the utmost professionalism and kindness. We not only handle custom kitchen design, but much, much more! Are You Ready for Professional Results? Regardless of whether you are interested in custom kitchen cabinets, custom bathroom remodeling & design services or new kitchen installation in Chicago, Lincoln Park, Lakeview & the Gold Coast, our team at Chicago Custom Kitchens is ready to exceed your expectations. When you are searching for the best custom kitchen company to handle your needs, look no further than what we have to offer. We have delivered superior results to hundreds of customers and are looking forward to providing you with the same amazing results. 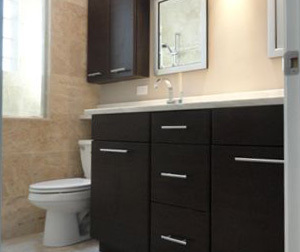 At Chicago Custom Kitchens, we specialize in remodeling & installation. You can request our services for your new kitchen installation or for cabinet design & remodeling services for other rooms. We also handle a vast array of other design and renovation needs you may have, such as custom bathroom remodeling & design services. 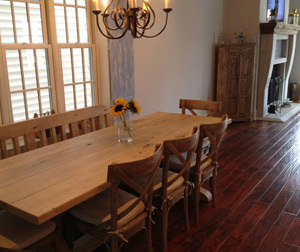 With us, you can change the aesthetic of the most important rooms in your house. We’ll even handle the smaller details of your home. We offer a full gamut of detail services, including bathroom cabinet remodeling and installation services, countertops for kitchens & bathrooms and custom kitchen cabinets. No matter what sort of renovation work you need to be done, we have the expertise to help you meet your goals! This is why we’ve been named the ultimate kitchen and bathroom cabinet design center. When it comes to remodeling & installation services, you need a company you can rely on. We offer affordable kitchen design services, as well as cabinet design & remodeling services for all spaces in your home. Our goal is to give you the comprehensive remodeling and renovation services you want. Creating an amazing kitchen or bathroom space can be quite challenging, especially if you don’t have the right company on your side. With our extensive experience in kitchen remodeling services, we can help you make a space more functional, bigger, or more modern – with an end result you love showing off. If you are ready to get started with your remodel or renovation service, contact the team at our kitchen and bathroom cabinet design center. You won’t be disappointed with the results we can help you achieve. Interested in what we can do? Our services cover the Chicago, Lincoln Park, Lakeview and Gold Coast areas. The kitchen of your dreams can become a reality without the painstaking work of looking for the right kitchen customization company. 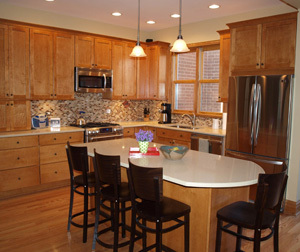 Custom kitchens are what Chicago Custom Kitchens specializes in to upgrade your home to a showcase. Our experienced professionals know exactly how to get the job done on-time and on-budget for beautiful results. Whether you need brand new kitchen cabinets, kitchen cabinet remodeling, countertops or that custom kitchen and bath to give your home a unique personality, we are available to help you. Our experienced contractors are available to help with any job, large or small. A major reason many homeowners avoid kitchen remodeling is because they think it is too expensive. However, we offer affordable kitchen design that can fit virtually any budget. You can enjoy the prestige and beauty custom kitchen cabinets can bring to not only your kitchen, but to the overall look of your home. There are so many choices when it comes to new kitchen installation, making it difficult to decide which company to choose. However, the best custom kitchen company to meet your needs is one that takes the time, effort and care to meet and exceed your expectations. If you’re looking for custom kitchens and baths in the Chicago, Lincoln Park, Lakeview or Gold Coast area, call our professionals at 773-935-6272.